With a blink of an eye, December has come to a close. We’re counting down the 12 days of Christmas into the New Year, but not without another HomeLight’s Real Estate Recap! Every month, HomeLight scours the internet for the latest real estate stories to create an informative monthly digest so that you’re up to date with the goings-on in housing. From the stock market to climate change, 2018 has been a year of ups and Dows. 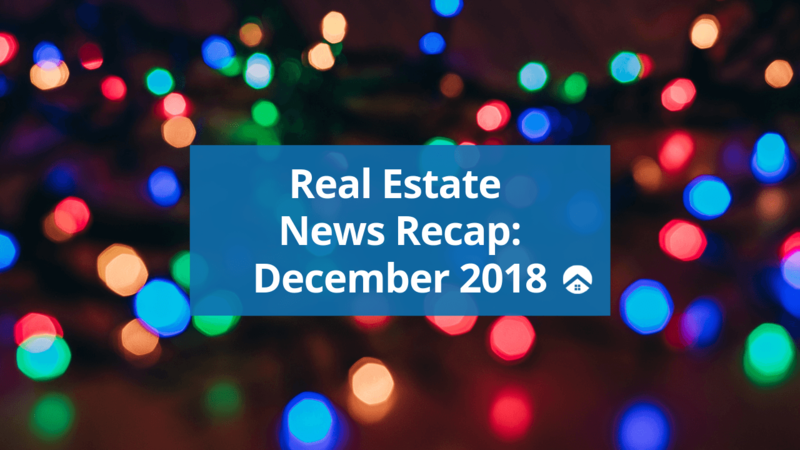 Despite the holiday cheer and Michael Buble’s Christmas album, December wasn’t that jolly of a month in terms of housing news for sellers and buyers. + The average 30-year fixed rate is now about 4.83 percent, up from 4.09 percent in 2015. That has cost the average homebuyer roughly $42,000, WalletHub found. + “For investors with existing assets that have generated profits — capital gains — reinvesting those gains into these new funds could deliver a sizable tax break. And for the struggling areas — dubbed opportunity zones — the funds could deliver an infusion of investor money that typically would bypass them” (CNBC, Heard the buzz about opportunity zone funds? Here’s the skinny). + Pretty similar to the 1031 exchange, but with different rules and mission statement. + “Some have called the 1031 exchange ‘a perpetual deferral until the ultimate exit.’ If at any point an investor sells an asset, they are on the hook for the gains. This leaves most investors holding their real estate until death (the ultimate exit) so that at least their heirs get the step-up in basis. With Opportunity Zones, investors don’t have to die to eliminate the capital gains tax burden. After 10 years, the entire basis automatically steps up. And investors don’t have to jump through hoops to get it. + Op Zones are, however, under scrutiny for favoring certain areas with “more potential” than other communities that really need the monetary attention. + California fire claims have reached $9 billion and is expected to rise even more. Following the aftermath, California wildfire victims face new challenges finding housing (Market Watch): “For the thousands of Californians who now find themselves homeless, matters may only get worse thanks to the state’s extremely competitive, pricey real-estate market. ‘These market conditions that require would-be home buyers to make quick decisions are not easy for buyers,’ said Danielle Hale, chief economist at Realtor.com. 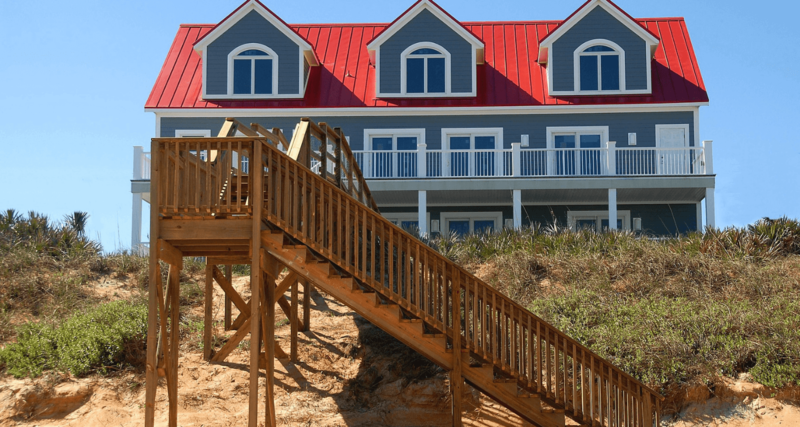 + It’s a known fact that millennials are purchasing homes later in life when compared to their baby boomer parents. Affordability is one explaining factor, but what about other options, like co-living, an alternative to renting and buying a home? + Hospitality experts believe that this is next step in renting. So much so that investors are pouring their cash into this communal-living experience. + It’s become a global phenomenon (Business Times, All together now: The growing co-living scene in Singapore) and has gained local traction. Medici has plans to expand to states in 2019 with properties already in New York and Chicago. + The federal government released a climate assessment following the UN’s climate report, with not so great news. + And, on infrastructure, “Our Nation’s aging and deteriorating infrastructure is further stressed by increases in heavy precipitation events, coastal flooding, heat, wildfires, and other extreme events, as well as changes to average precipitation and temperature. Without adaptation, climate change will continue to degrade infrastructure performance over the rest of the century, with the potential for cascading impacts that threaten our economy, national security, essential services, and health and well-being” (NCA, Fourth National Climate Assessment). + Cities are implementing their own bills to curb pollution, while some people are taking it upon themselves to buy property in less affected areas as preparation for climate change-related disasters and evacuation. NYTimes, Climate Change Insurance: Buy Land Somewhere Else: “A small number of young professionals who are preparing homes away from the places where climate change is expected to strike the hardest. + They have studied maps and research that show the areas of the country that will be less affected by devastation, either because of geography or an ample supply of natural resources. And they are optimistically buying land and homes in these areas, many of them mentioned in an article published in Popular Science in December 2016 titled “These will be the best places to live in America in 2100 A.D.,” which has amassed 28,000 views in the past six months and gets about 100 Google search hits a day. + See how your state is doing and where people are moving to with this interactive map. + The Verge, How Alaska fixed its earthquake-shattered roads in just days: “‘We have more quakes than any other state in the Union,’ says Shannon McCarthy, a spokesperson with the Alaska Department of Transportation and Public Facilities. As a result, Alaska takes its earthquake preparation very seriously. + The largest earthquake ever recorded in the country shook Anchorage to its core in 1964, causing a deadly tsunami and leaving in its wake damaged buildings, buckled roads, and a legacy that inspired years of earthquake preparation and policies. Strong building codes put in place post-1964 helped make the area more secure than other earthquake-prone areas, like Seattle. + Overall, a crashing stock market and an impending recession lower consumer confidence and affordability of houses, limiting the pool of eligible buyers. Consequently, sellers lower their prices or else they risk sitting on the market for months on end. + Pantone, PANTONE 16-1546 Living Coral: “Vibrant, yet mellow PANTONE 16-1546 Living Coral embraces us with warmth and nourishment to provide comfort and buoyancy in our continually shifting environment. + Sociable and spirited, the engaging nature of PANTONE 16-1546 Living Coral welcomes and encourages lighthearted activity. Symbolizing our innate need for optimism and joyful pursuits, PANTONE 16-1546 Living Coral embodies our desire for playful expression. + “MONEY spoke with five dedicated light show creators who have decorated their homes for anywhere from five years to four decades, all while adapting to new technology, managing electricity bill costs, dabbling in programming, creating fresh designs, curating the perfect playlist, and balancing a regular job on top of all of it. Get this every month. Plus, home selling tips from America's top agents. Catrina is a native San Franciscan with a B.A. in Psychology and minor in Cinema and Media Studies from Wellesley College. A storyteller at heart, she loves to write about people, films, and of course, real estate. Don't be surprised if you catch her browsing luxury homes on Instagram or obsessing over the latest market trends.